Alexandra Gray, Senior Lecturer at London School of Business and Finance, was quoted in this feature about the importance of emotional intelligence for accountants published in the April edition of ACCA Student Accountant Magazine. On Monday 8 April London School of Business and Finance’s Career Report was mentioned in this article about recruitment tips for millennials published in European CEO. London School of Business and Finance was mentioned in this interview with Adetola Nola, LSBF’s alumnus and innovative entrepreneur who founded Veritasi Homes, published in Vanguard Nigeria on Friday 5 April. 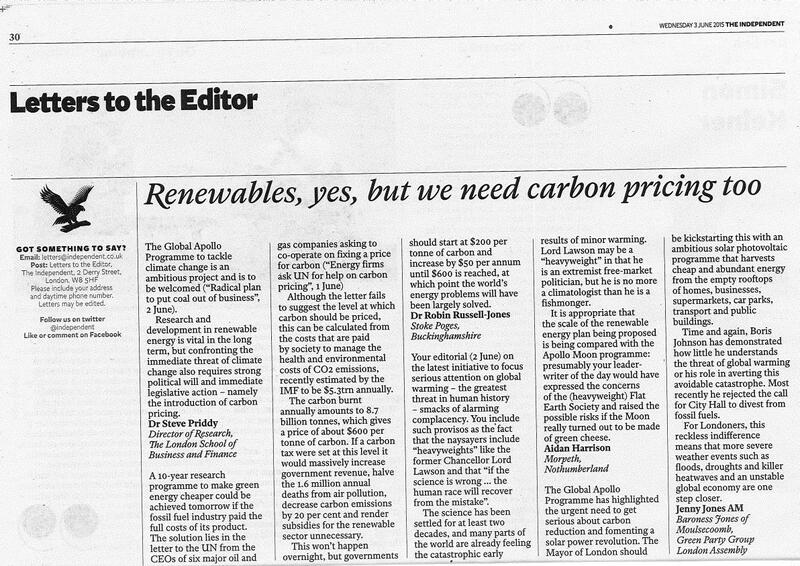 Drs Peter Jansen, principal lecturer at London School of Business and Finance, was quoted in The Times supplement Raconteur about climate change, published on Thursday 4 April. On Tuesday 2 April Business World announced the partnership between London School of Business and Finance in Singapore and University of Greenwich. The news, published on Monday 1 Aprile in the printed edition of PQ Magazine, announces the return of LSBF TV for AAT students. 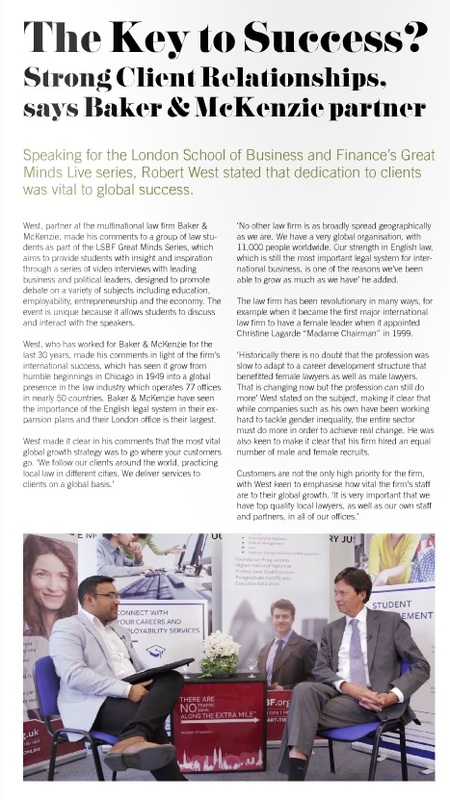 The partnership between LSBF in Singapore and iBosses Vietnam was featured in the printed edition of PQ Magazine, published on Monday 1 April. Brigita Petrova, tutor at London School of Business and Finance and winner of the 2019 PQ Award for Lecturer of the Year was interviewed for the April edition of PQ Magazine. On Tuesday 26 March PQ Magazine announced the partnerships for LSBF in Singapore with iBosses Vietnam to deliver ACCA courses in the country, featuring quotes from Rathakrishnan Govind, LSBF Global CEO. On Thursday 14 March The Engineer mentioned London School of Business in this news about InterActive Pro recent partnership with Brunel University. Phone Week mentioned London School of Business in this news about InterActive Pro recent partnership with Brunel University in this news published on Thursday 14 March. Dessy Ohanians, Managing Director Certificate and Corporate programmes at London School of Business was quoted in this feature from We Are The City published in occasion of International Women's Day on Friday 8 March. On Wednesday 6 March London School of Business and Finance was mentioned in FE News, as one of the finalists shortlisted for the Study Resource of the Year award at the PQ Awards 2019. On Monday 4 March Study Travel Magazine reported the partnership between London School of Business and Finance and iBosses Vietnam. On Friday 1 March London School of Business and Finance was featured in three articles published in the monthly issues PQ Magazine, with regards to the Careers in Accountancy event held in January. London School of Business and Finance was mentioned in Arab News on Friday 1 March, about alumnus Amr Banaja, CEO of Saudi Arabia’s General Entertainment Authority. London School of Business and Finance was mentioned in AIA Worldwide in this feature about the winners at the PQ Awards 2019, published on Friday 1 March. On Wednesday 27 February London School of Business and Finance's alumnus Lukman Otunuga was mentioned in FX Empire. On Friday 15 September PQ Magazine announced the return of LSBF TV for AAT students. London School of Business and Finance was mentioned in this news about alumnus Oluwatoyin Aralepo, the new Chief Financial Officer of Cellulant. The article was published in The Nation on Wednesday 13 February. On Tuesday 12 February Education Investor Global announced the launch of London School of Business and Finance Global Bundling initiative, publishing the news in the printed edition of the magazin. London School of Business and Finance was featured in the latest issues of Education Investor Global printed magazine. LSBF was mentioned within an interview with Aaron Etingen, GUS CEO. On Tuesday 12 February Punch mentioned London School of Business and Finance alumnus Oluwatoyin Aralepo, recenlty appointed Chief Financial Officer of Cellulant, a Pan-African financial technology service provider. The latest issues of Student Accountant Magazine, published on Wednesday 6 February, features an article about the importance of ethics in accountancy. Rob Sowerby, Professional Courses Director at London School of Business and Finance, is quoted in the article. London School of Business and Finance was mentioned in this article featured in the monthly issue of PQ Magazine published on Friday 1 February, regarding the “Careers in accountancy” event in collaboration with AAT and ACCA. On Tuesday 29 January London School of Business and Finance was mentioned in Vietnam.net, announcing a strategic cooperation on international financial management training with iBosses Vietnam. Paul Merison was quoted in this Bloomberg Opinion feature about the quality of company audits, published on Thursday 24 January. On Thursday 24 January, Yahoo! Finance included comments from LSBF's Lecture Paul Merison in this feature about the quality of company audits. On Wednesday 23 January London School of Business and Finance was mentioned in Dien Dan, announcing a strategic cooperation on international financial management training with iBosses Vietnam. This news about the 'Careers in Accountancy' event was published in PQ Magazine on Friday 11 January. PQ Magazine announced the “Career in accountancy” event, organised in collaboration with London School of Business and Finance, on Wednesday 2 January. London School of Business and Finance was mentioned in this article featured in the monthly issue of PQ Magazine published on Tuesday 1 January, announcing the “Careers in accountancy” event planned for January 2019, in collaboration with AAT and ACCA. On Tuesday 1 January PQ Magazine published these advice from Paul Merison, Director of ACCA at London School of Business and Finance. On Thursday 27 December The PIE News announced London School of Business and Finance Global Accounting initiative, combining top Academic Awards with Professional ACCA qualification. The news published in PQ Magazine on Friday 21 December announces the launch of the Global Bundling initiative, combining ACCA qualification provided by London School of Business and Finance with top academic degrees and MScs. On Friday 14 December London School of Business and Finance launched the Global Bundling initiative, combining top Academic Awards with Professional ACCA qualification. The announcement mentions the institutions partnering with LSBF on this initiative, and features quotes from Rob Sowerby, Director of Professional Courses at LSBF. London School of Business and Finance was mentioned in this news in PQ Magazine on Thursday 13 December, announcing the ‘Career in accountancy” event planned for January 2019, in collaboration with AAT and ACCA. On Thursday 13 December Education Investor Global announced London School of Business and Finance Global Accounting initiative, combining top Academic Awards with Professional ACCA qualification. On Monday 10 December Dessy Ohanians, Managing Director Certificate and Corporate programmes at London School of Business and Finance, was quoted in The Daily Telegraph in this article about adaptability in the workplace. The launch of LSBF AAT TV was reported in the latest issues of PQ Magazine, released on Saturday 1 December. On Saturday 1 December Student Accountant Magazine published this feature about the importance of being qualified. Rob Sowerby, Professional Courses Director at LSBF and Lecturer Elaine Garcia were quoted in this article. This article published in Mirage News on Thursday 29 November mentions London School of Business and Finance e with regards to a Study Tour organised by Curtin University. On Wednesday 21 November London School of Business and Finance was mentioned in this article in Sinproquim, regarding an event to discuss partnerships in higher education. Obabiyi Fagade, London School of Business and Finance’s alumnus, was mentioned in this article by YNaija.com on Thursday 15 November as one of the most influential young Nigerians under 40. On Monday 12 November Rob Sowerby, Director of Professional Courses at London School of Business and Finance, was quoted in The PIE News exploring accountancy and finance education. LSBF was mentioned as one of the providers successfully adapting to new ways of learning. Education Technology announced the launch of LSBF AAT TV on Saturday 10 November, including quotes from Rob Sowerby, Director of Professional Courses at LSBF. London School of Business and Finance was mentioned in Power Technology on Friday 2 November discussing the UK fracking industry, with comments from principal lecturer Drs Peter Jansen explaining the environmental effects. On Friday 2 November the launch of the LSBF App by London School of Business and Finance was featured in the latest issue of the QS WOW News magazine. The launch of LSBF AAT TV was reported in two articles in PQ Magazine publihsed on Thursday 1 November issues of the printed magazine. The features include an interview with Rob Sowerby, Director of Professional Courses. On Thursday 1 November, Martin Jones, Lecturer at London School of Business and Finance, shared tips and advice on the Strategic Business Report exam in PQ Magazine. On Monday 22 October London School of Business and Finance was mentioned in this article, published in Consultancy UK, announcing the appointment of former student Paul Hawtin as Head of HR for CBRE. London School of Business and Finance, was mentioned in this article about the International Telematic University Uninettuno published in University World News on Saturday 20 October 2018. On Wednesday 10 October London School of Business and Finance was mentioned in PQ Magazine, in an article about the launch of LSBF's AAT TV. On Monday 24 September, LSBF was mentioned in this Red Bull article referencing the Careers Report comissioned by the school. Red Bull is initiating a free online personality tests. London School of Business and Finance was mentioned in this article from 19 September concerning the appointment of LSBF alumnus Dr. Rahul Gupta as Senior Vice President and Chief Medical Health Officer at the March of Dimes. London School of Business and Finance was mentioned in this Thursday 13 September article from Cayman News Service. The article announces LSBF alumna Sian Pairaudeau as the new Deputy Director of Labour Needs and Supply at the Workforce Opportunities and Residency Cayman (WORC) unit. On Monday 11 September, London School of Business and Finance alumnus Lukman Otunuga published this article on US-China relations for Thomson Reuters Zawya. On Saturday 8 September, London School of Business and Finance was mentioned in this Global Banking & Finance Review article announcing the launch of their #CareersInCharity campaign in collaboration with GISMA Business School and The University of Law Business School. This BBC 3 article, from Thursday 6 September 2018, on 54% of millenials saying they want to change their careers, mentions the 2015 London School of Business and Finance study discovering this statistics. On Thursday 6 September, London School of Business and Finance alumna Camilo Villalba was mentioned on West website as Chief Operating Officer of Blueberries SAS. Career advice from London School of Business and Finance's own Managing Director of Certificate and Corporate Programmes, Dessy Ohanians, was featured in this We Are The City article on Wednesday 5 September. Dessy's article focused on interview preparation and presentation. London School of Business and Finance alumnus Lukman Otunuga was mentioned in this Monday 3 September 2018 article from FX Empire on the week's market themes. News of London School of Business and Finance alumnas Alexandre Mateus was featured in this Finance Magnates article on Monday 3 September. Alexandre has been added to the Societe Generale forex trading team in Paris. London School of Business and Finance was mentioned in this article on the 2018 Women in Finance Scholarship. Recipient Monica Carrasco studied a post-graduate course in Financial Risk Management. On Friday 17 August, London School of Business and Finance's 2015 Careers Report was mentioned in this article by AAT Comment, about how to handle a mid-life career change. The launch of the Study LSBF was announced in this article in Global Banking & Finance Review published on Tuesday 14 August. On Saturday 11 August, London School of Business and Finance’s alumna Dabota Lawson was featured in this article in The Guardian Nigeria, about the beauty industry in Nigeria. London School of Business and Finance Careers Report was mentioned in this article about changing career, published on Friday 10 August in Marketing Week. The “Being Global – Futureproof Your Career” conference, arranged with London School of Business and Finance, was mentioned in PQ Magazine published on Tuesday 7 August. On Tuesday 7 August, the launch of AAT Level 4 for London School of Business and Finance was announced in PQ Magazine. Rob Sowerby, Professional Courses Director, was quoted as he spoke of the benefits of the new course. London School of Business and Finance in Singapore was mentioned in this article about the achievement of ACCA Silver Approved Learning Provider Status, and its partnership with Bridge Business College. The article was published in QS Asia WOW NEWS Magazine on Monday 6 August. On Friday 3 August Dessy Ohanians, Managing Director of Certificate and Corporate Programmes at London School of Business and Finance, published this article in We Are The City about how to write an effective CV. Peter Jansen, Principal Lecturer at London School of Business and Finance, published this article about sustainable business in Global Banking & Finance Review on Wednesday 1 August. Comments from Rob Sowerby, Director of Professional Courses at the London School of Business and Finance, were included in this article published by ACCA Student Accountant Magazine on Wednesday 1 August. London School of Business and Finance launches mobile app "Study LSBF"
George Brown, Head of Employability and Careers at London School of Business and Finance, contributed comments to this advice article on career setbacks published in Friday Magazine (Gulf News) on Friday 27 July. Rob Sowerby, Director of Professional Courses at the London School of Business and Finance, was quoted in this Racounter Media feature about how to integrate sales in business strategy, published on Thursday 26 July. On Saturday 25 July London School of Business and Finance’s alumna Noelie Demaegdt published wrote an article for GreenBiz about energy efficiency in food processing technologies. London School of Business and Finance was mentioned in this Digital Journal article about services provided by Straker Translations on Monday 23 July. On Wednesday 6 July London School of Business and Finance was mentioned in this article in HR News about how companies can improve their working environment. On Thursday 5 July London School of Business and Finance and InterActive Pro were mentioned on the PQ Magazine website, announcing the launch of AAT Level 4 course. On Monday 4 June - London School of Business and Finance was mentioned in PQ Magazine; speaking of the 'Being Global' conference planned for Monday 11 June. On Friday 1 June - London School of Business and Finance was mentioned in the June issue of PQ Magazine; announcing the running of its award-winning Facebook Live sessions for the June ACCA exams and listing the times and details of each session. On Friday 1 June - London School of Business and Finance was mentioned in several articles of the June issue of PQ Magazine, announcing the career-focused "Future-proof" conference planned for June 11. On Tuesday 22 May - London School of Business and Finance was mentioned in PQ Magazine; speaking of the 'Being Global' conference planned for Monday 11 June. On Wednesday 16 May, London School of Business and Finance was mentioned in Nairametrics in reference to the succesful operations of Cement Copmany of Northern Nigeria Plc; which is run by CEO and LSBF alumni Alhaji Ibrahim Aminu. On Tuesday 8 May, London School of Business and Finance was mentioned in the Swazi Observer in an article concerning the "Movers and Shakers" of the Swazi maize industry; one of whom is LSBF alumni and current CEO of the National Maize Corporation - Sabelo Msibi. On Thursday 3 May, London School of Business and Finance was mentioned in several articles of PQ Magazine, announcing the career-focused "Future-proof" conference planned for June 11. On Wednesday 2 May, Dessy Ohanians, Managing Director of Executive Education at London School of Business and Finance, was featured in a Women in Leadership article as one of the finalists at the 2017 Future Leaders Awards of Women in the City. On Tuesday 1 May, London School of Business and Finance was mentioned in several articles of PQ Magazine, announcing the career-focused "Future-proof" conference planned for June 11. On Friday 27 April London School of Business and Finance was mentioned in PQ Magazine, announcing the career-focused conference planned for June 11. On Tuesday 10 April, Lukman Otunuga, London School of Business and Finance alumni, published this article on the future of global equity firms in the modern climate for Thomas Reuters Zawya. Rathakrishnan Govind, LSBF Global CEO, was quoted in this article published in the April edition of Study Travel Magazine, focusing on higher education in Singapore. On Monday 26 March the London School of Business and Finance was mentioned in the news regarding the launch of GUS Education (India) Hyderabad. Paul Merison, Director of ACCA at London School of Business and Finance, was mentioned in this article in the April issue of the printed magazine, with regards to a paper published for the March exam. On Thursday 15 March,London School of Business and Finance’s alumni Lukman Otunuga published this article in Thomson Reuters Zawya about tariffs and production cuts in the steel industry. On Monday 12 March, Dessy Ohanians, Managing Director of Executive Education at London School of Business and Finance, published this article in We Are The City, looking at how volunteering in certain roles can help women to reach board positions. On Monday 12 March, Small Business UK published this article by Dessy Ohanians, Managing Director of Executive Education at London School of Business and Finance, about the five essential quality entrepreneurs need to succeed. On Monday 5 March London School of Business and Finance launched the #WonderWomen campaign, an initiative to celebrate women leaders and entrepreneurs for International Women's Day. London School of Business and Finance's alumni Lukman Otunuga published this article in Thomson Reuters Zawya on Monday 26 February. On Thursday 22 February LSBF's Career Report was mentioned in this article in The Independent. The article included a link to the report. On Wednesday 21 February PQ Magazine published London School of Business and Finance tips for ACCA exams. On Friday 26 January London School of Business and Finance in Singapore was mentioned in this article in Markets Insider, announcing the launch of a new Diploma of Sustainable Operations, delivered in collaboration with the Australian Centre for Sustainability Studies and Training (ACSST). London School of Business and Finance in Singapore was mentioned in this article in Asia One, on Monday 26 January. The article announces the launch of a new Diploma of Sustainable Operations, delivered in collaboration with the Australian Centre for Sustainability Studies and Training (ACSST). On Monday 22 January Georgia Today announcement an agreement between London School of Business and Finance agreement and The British Georgian Chamber of Commerce (BGCC), to deliver Advanced Certificate Online Programs. On Wednesday 3 January Rob Sowerby, director of professional courses at London School of Business and Finance, was featured in the ACCA Student Accountant Magazine in this article about self study. This article about the ACCA P2 Corporate Reporting exam, written by LSBF's lecturer Martin Jones, was published in the January issue of PQ Magazine released on Tuesday 2 January. On Friday 22 December the Pune Mirror published this story about London School of Business and Finance's alumni Yousuf Irani. On Thursday 30 November Dessy Ohanians, Managing Director of Executive Education at LSBF, published this article in Small Business UK, about what to look for when choosing a business partner. On Friday 17 November Professor Dr Maurits van Rooijen, Rector at London School of Business and Finance (LSBF), published this article in The Huffington Post, about the career benefit brought by a study abroad experience. London School of Business and Finance was mentioned in this article in Al-Fanar Media about New York University in Abu Dhabi as one of the higher education institutions present in the region, published on Sunday 12 November. Seun Akinyelu, London School of Business and Finance’s alumni, was interviewed on Friday 10 November in The Guarduan Nigeria regarding a conference as part of efforts to drive the Nigerian economy towards greater efficiency. On Thursday 2 November The Huffington Post published this article about freelance freedom and blockchain technology, mentionin LSBF alumni Rushabh Shah. The November printed edition of PQ Magazine reported London School of Business and Finance (LSBF) Online’s initiative to offer free online tuition for the AAT Level 2 Foundation Certificate, delivered online by InterActive. On Monday 9 October LSBF Global CEO Rathakrishnan Govind was featured in China Daily, discussing LSBF's involvement in the Belt and Road Initiative. London School of Business and Finance was mentioned in this article in Business In Cameroon looking at the listing for the “Choiseul 100 Africa 2017: Economic Leaders for Tomorrow”, with LSBF’s alumni Bony Dashaco ranking 9th in this edition, on Wednesday 4 October. On Monday 2 October PQ Magazine reported London School of Business and Finance (LSBF) Online’s initiative to offer free online tuition for the AAT Level 2 Foundation Certificate, delivered online by InterActive. Paul Merison, ACCA Director at London School of Business and Finance, is featured in the October issues of PQ Magazine published on Wednesday 20 September. He writes about ACCA exams pass rate and how to prepare for better result. On Wednesday 13 September The Huffington Post published this blog by Professor Dr Maurits van Rooijen, Rector at LSBF. He looks at what education is doing to prepare graduates to live in a VUCA (volatility, uncertainty, complexity, and ambiguity) world. London School of Business and Finance was mentioned in this article about the Chief Minister Good Governance Fellowship Programme (CMGGF) on Sunday 10 September in The New Indian Express. On Tuesday 5 September YNaija News London School of Business and Finance alumni Obabiyi Fagade was mentioned in this article announcing the #YNaijaPowerList 2017, as one of the most influential young Nigerians under 40 in business. On Monday 4 September London School of Business and Finance (LSBF) Online announced free online tuition for the AAT Level 2 Foundation Certificate to help students work towards a recognised accountancy qualification. On Tuesday 15 August City A.M. mentioned The LSBF Careers Report in this article, about the costs of employess turnover. On Monday 14 August PQ Magazine published LSBF's advice and tips on the ACCA September papers. ACCA Student Accountant published an advice piece for students taking a break from their studies, on Wednesday 2 August. Rob Sowerby, Director of Professional Courses at LSBF was prominently featured throughout the article with his comments and insights. On Monday 31 July London School of Business and Finance in Singapore was mentioned in this article in Business Standard, about students completing their International Hospitality Management course studying through Chennais Amirta International Institute of Hotel Management. On Monday 31 July London School of Business and Finance in Singapore was mentioned in this article in New Kerala, about students completing their International Hospitality Management course studying through Chennais Amirta International Institute of Hotel Management. On Friday 14 July The Huffington Post published this article from Professor Maurits van Rooijen, Rector of London School of Business and Finance (LSBF). Looking at the recent results of the Teaching Excellence Framework, he analyses how the learning experience would benefit from a different approach aimed at making more enjoyable. On Friday 30 June Daily Mirror Sri Lanka announced the Memorandum of Understanding signed by London School of Business and Finance Singapore with Swiss Hospitality School. On Friday 9 June Isto E' Dinheiro published this article, about the outcome and possible consequence of UK General Election, featuring comments from Professor Maurits Van Rooijen, Rector of London School of Business and Finance. Professor Maurits van Rooijen, Rector of London School of Business and Finance (LSBF) was featured with this article in The Huffington Post on Tuesday 9 May. Looking at the anniversary of the ERASMUS programme, he looks at its impact on British students and how this could change due to Brexit. On Saturday 6 May LSBF’s Managing Director of Executive Education Dessy Ohanians was featured in Entrepreneur & Investor, analysing the relationship between reputation and reputation and sharing insights on how to grow and protect both. London School of Business and Finance in Singapore was featured in The Middle Ground, on Friday 5 May. The article looks at how private provider manage to stay relevant and competitive, and features quotes from Dr Michael Cope, Director of Studies at LSBF. On Friday 28 April this follow up article in Isto E' Dinheiro about the Presidential Election in France featured further insights from Professor Maurits Van Rooijen, on the possibility of “Frexit” in case of Marine Le Pen’s victory. A comment from Professor Maurits Van Rooijen, Rector at London School of Business and Finance, was featured in this Isto E' Dinheiro article about the Presidential election in France on Thursday 27 April. In his comment, he looks at the further risks for the EU stability that a victory of Marine Le Pen could cause. On Wednesday 26 April this article by LSBF’s Managing Director of Executive Education Dessy Ohanians was published in Association of MBAs. In this article, she writes about the “inverted classroom”, analysing this diverse approach to education. The April issue of PQ Magazine mentions the new March sessions of the Facebook Live ACCA Mentoring programme, also reporting the learning initiative as winner of the "Best use of social media" prize at this year PQ Magazine Awards. LSBF is mentioned in this article on the April issues of PQ Magazine. Reporting on the ceremony for the 2017 PQ Magazine Awards, the article highlights LSBF's alumna Susan Azzabi winning in the "Distance learner of the year" category. On Monday 6 March The Huffington Post published this article by LSBF’s Rector Professor Maurits Van Rooijen, outlining his thoughts on the new ‘fast-track’ two-year degrees suggested by the UK government. LSBF in Singapore was featured in The Middle Ground on Tuesday 21 February. Through student’s testimony the article remarks the reputation of the school, its teaching standards and the quality of the facilities, also mentioning Managing Director Rathakrishnan Govind. On Monday 20 February The LSBF Careers Report was mentioned during The One Show on the BBC, discussing the Metropolitan Police's new recruitment policy of searching for talent from other professions. On Thursday 16 February London School of Business and Finance alumnus and FXTM research analyst Lukman Otunuga has been interviewed by The Cable on the devaluation of Nigerian naria and Central Bank of Nigeria’s strategy. LSBF alumnus and FXTM research analyst Lukman Otunuga has been interviewed by FXStreet, discussing factors that may be affecting stock markets and causing currency fluctuations at the start of 2017, on Monday 13 February. On Monday 30 January the Huffington Post published this article by Professor Maurits Van Rooijen, Rector and Chief Executive at LSBF, about the characteristics of higher education and how ‘edupreneurs’ can help further develop and inspire in this sector. On Tuesday 24 January the LSBF #Facebook Live ACCA mentoring series has been mentioned in PQ Magazine. The article on Isto E Dinheiro published on Friday 13 January features a comment from Professor Maurits Van Rooijen’s, Rector and Chief Executive at LSBF, on the current political and economic situation in Europe. This article on Management Today published on Friday 16 December features LSBF Rector and CEO Professor Maurits Van Rooijen's comments on the opportunity for entrepreneurs to do MBAs. On Thursday 15 December The Huffington Post published this article from Professor Maurits Van Rooijen, Rector and CEO of LSBF, reflecting on the advantages of combining liberal arts and career focused education the gain better employability on the long run. Professor Maurits Van Rooijen, LSBF Rector and CEO, was published on Changeboard with this article about leadership, analysing different types and styles of leading the workforce and how they can be effective, on Monday 12 December. On Friday 28 October The PIE featured this article by Professor Maurits Van Rooijen, Rector and CEO of LSBF, on the phenomenon of "migration mercantilism" and its consequences. Professor Maurits van Rooijen, Rector and CEO at London School of Business and Finance, reflects on how extrapreneurship is the future of entrepreneurship to drive commercial success in this article published in The Huffington Post on Wednesday 19 October. The LSBF Careers Report was mentioned in this article about switching careers on Management Today, on Monday 17 October. Ravi Mehndiratta, Assistant Director of Sales & Front Office Operations for LSBF Singapore, was quoted in this The Middle Ground's article, discussing the most important factors students should consider when looking at higher education private providers, on Wednesday 5 October. LSBF former Careers Team member Mohammed Rahman was mentioned in this article on ACCA Global, warning on the risks of procrastination at work, on Wednesday 28 September. Richard Branson's interview for LSBF Great Mind Series was mentioned in this article in The Huffington Post on Wednesday 14 September. The Huffington Post featured this article from Professor Maurits Van Rooijen, LSBF Rector and CEO, on Monday 15 August. LSBF Rector and CEO Professor Maurits van Rooijen’s article was published on Wednesday 27 July in The Huffington Post. LSBF Rector & CEO Professor Maurits van Rooijen was quoted in an ANSA (Brazil) article discussing the appointment of Theresa May as the new Prime Minister of the United Kingdom, on Wednesday 13 July. LSBF Rector and CEO Professor Maurits Van Rooijen was quoted in an article discussing the implications of the EU Referendum vote on the UK economy in Brazil’s Isto E Dinheiro on Friday 17 June. Lukman Otunuga, LSBF alumnus and research analyst with FXTM, was quoted in The Telegraph’s article on FTSE 100 nearing a four-month low on Thursday 16 June. The LSBF Careers Report was mentioned in The Huffington Post’s article discussing career options for graduates on Friday 10 June. LSBF alumnus and research analyst with FXTM Lukman Otunuga was featured in Vanguard (Nigeria) talking about the outlook for Nigeria’s economy in the short as well as long term on Friday 3 June. On Friday 3 June LSBF alumnus and research analyst with FXTM Lukman Otunuga was interviewed by The Cable on the outlook for Nigeria’s economy in the short as well as long term. LSBF Business Development & Placements Executive Mohammed Rahman was quoted in a Guardian article discussing how to apply for your dream job on Wednesday 27 April. LSBF Associate Lecturer Ben Botes receiving with the prestigious ‘Innovator of the Year’ award at the South African Chamber of Commerce and Brand South Africa Business Awards, was featured in The South African on Wednesday 20 April. LSBF CEO & Rector Professor Maurits van Rooijen’s article titled ‘EU Freedom of Movement Is Good for British Businesses - And for Your Career’ was published in The Huffington Post on Monday 18 April. LSBF Interim Head of Employability & Careers George Brown has been quoted in a JobsNHire article on job-hunting on Monday 18 April. GUS chief academic officer Professor Dr Maurits van Rooijen’s article titled ‘Global Experience and the Multinational University’ was published in the North American higher education e-newspaper The Evolllution, on Wednesday 6 April. LSBF’s online MBA was mentioned in Business Day, one of South Africa’s national newspapers, as part of a feature on e-learning with a focus on Africa, on Tuesday 22 March. LSBF interim head of employability and careers George Brown was quoted in a Guardian article on job-hunting, on Monday 21 March. BDaily this week featured an article from The Language Gallery’s Academic Director Lea Aylett making the social case for language learning, on Thursday 17 March. An article authored by LSBF CEO & Rector Professor Maurits van Rooijen on the importance of interpersonal skills in today's workplace was published in The Huffington Post, on Tuesday 15 March. BDaily this week featured an article from Study InterActive’s Director of Academic Affairs Jeremy Bradley discussing online security issues that educational institutions have to face with e-learning, on Tuesday 8 March. The Guardian cited the LSBF Careers Report in a Comment is Free article on factors behind workers quitting their jobs, on Tuesday 8 March. The LSBF Careers Report was mentioned in a Grazia article discussing if it is too late to change careers if you are in your thirties, on Monday 7 March. The LSBF Great Minds series interview with the Natural History Museum’s director Sir Michael Dixon was featured in GAAPweb, on Wednesday 2 March. LSBF Interim Head of Careers and Employability George Brown participated in a Guardian Live Q&A on job hunting and staying motivated after redundancy on Wednesday, 24 February. The LSBF Great Minds series interview with James Penny, Head of Europe (London) – Wealth and Investment Management at Barclays, was featured in GAAPweb, on Tuesday 23 February. LSBF’s launch of a new e-commerce website for CIMA and ACCA programmes was covered in several media outlets. LSBF GGSB MBA graduate Jasmin Schawalder, who is leading marketing department at big data start-up OpenSignal, was profiled in Business Because on Thursday, 31 January. LSBF career services manager George Brown was quoted in a Guardian feature on job hunting during the holidays on Monday, 21 December. LSBF associate lecturer Ben Botes was quoted in a Guardian feature discussing ‘The secret to better networking’ on Wednesday, 9 December. Jobseekers portal Egomnia’s new partnership with London School of Business and Finance (LSBF) was chronicled in Linkiesta (in Italian) on Monday, 30 November. The LSBF Great Minds interview with Sir Michael Dixon from the Natural History Museum was mentioned as a part of a feature discussing the importance of using technology in museums around the world in Channelnomics on Tuesday, 24 November. LSBF news writer Claire Payne’s article discussing ‘5 reasons why you should choose a career in fashion’ was published in Fish4 on Friday, 20 November. LSBF’s Great Minds series interview with Natural History Museum’s director Sir Michael Dixon was covered in several media outlets. LSBF’s Great Minds series interview with VTB Capital Plc’s Masroor Haq was covered in several media outlets. LSBF’s 2012 offering of a ‘MBA Diwali scholarship’ was mentioned in a Business Because article which looked at various educational promotions that have been launched over the years centred on the Hindu festival of lights, on Wednesday, 11 November. The re-launch of the LSBF student benefits programme My Student Offers was mentioned in several media outlets. LSBF Associate Lecturer Ben Botes was quoted in a Marketing Week article on brand personalisation on Tuesday, 10 November. An article by LSBF Rector & Chief Executive Professor Dr Maurits van Rooijen on the relevance of getting a university degree was published in The Huffington Post on Tuesday, 10 November. LSBF accountancy tutor Carolyn Napier was quoted in a Student Accountant feature on the importance of problem-solving skills for accountants, on Wednesday 14 October. LSBF’s Careers Report was mentioned in a Newswire article discussing how a negative outlook on life could be reason for an unhappy career, on Monday, 12 October. An article by GUS Chief Academic Officer and LSBF Rector & CEO Professor Maurits van Rooijen discussing his ‘ABC formula for organisational success’ was published in Changeboard magazine on Monday, 12 October. The findings from the LSBF Careers Report, which was published last month, has continued to be featured in various media outlets, blogs and news sites. The Recruiting Times reported on Friday, 9 October, on the findings of the LSBF Careers Report that 47% of Britons want career change. The LSBF study found that almost half of all workers in the UK would like to change careers. The LSBF Careers Report’s findings that 47% of UK workers desire a career change was reported in BDaily on Thursday, 29 September. People Management on Thursday, 24 September, discussed the findings of the LSBF Careers Report which looked at the British workforce’s desire for career change. LSBF Careers Services Manager George Brown was quoted in an article discussing how jobseekers with no (or limited) work experience can go about their respective job hunts, in The Guardian on Thursday, 24 September. LSBF Rector and Chief Executive Professor Maurits van Rooijen’s assessment of the results that emerged from the LSBF Careers Report, in an article titled ‘Do You Want a New Job? Odds Are That You Probably Do’, was published in The Huffington Post on Tuesday, 22 September. Yahoo Finance UK on Friday, 18 September, discussed the findings of the LSBF Careers Report which looked at the British workforce’s desire for career change. The LSBF Careers Report was discussed in a Fresh Business Thinking article on Friday, 18 September, titled ‘Half of UK workers want to leave their jobs’. The Telegraph on Friday, 18 September, reported on LSBF’s survey findings which revealed that almost half of all UK workers want to switch careers. The LSBF Careers Report discussing British workers’ desire for a career change was featured in City AM on Friday, 18 September. Management Today reported on the LSBF Careers Report on Friday, 18 September, noting how the study indicated that millennials in particular desired a career change for better pay, job satisfaction, status and work life balance. The Independent on Friday, 18 September, reported on LSBF’s survey findings which revealed that almost half of all UK workers want to switch careers. LSBF Director of Research Dr Steve Priddy was interviewed on Share Radio in a segment on their ‘Market Wrap Show’ discussing the LSBF Careers Report on Friday, 18 September. LSBF Career Services Manager George Brown contributed as a panellist on The Guardian’s Live Q&A discussion on how those without work experience could gain employment, on Wednesday, 16 September. 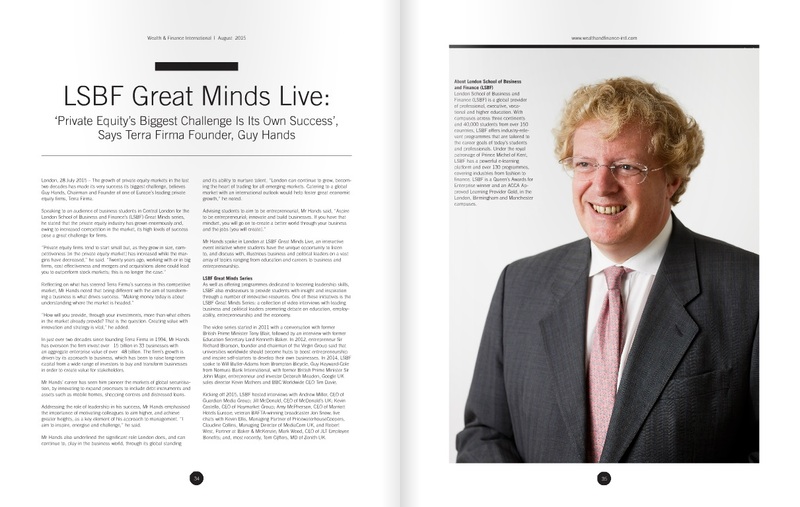 The LSBF Great Minds interview with Terra Firma founder Guy Hands was featured in the latest edition of Wealth & Finance International. The news story was published as a large two-page spread in print. The latest edition of LSBF’s Great Minds interview series, this time featuring Unilever’s Refreshments President Kevin Havelock, was widely covered in the media on Thursday, 3 September. LSBF rector & Chief Executive Professor Maurits van Rooijen’s article discussing the importance of experiential learning in the workplace was published in The Huffington Post on Wednesday, 26 August. LSBF Singapore’s announcement of its new partnership to offer programmes with the American College of Higher Education was covered in Sri Lanka’s Education Times on Saturday, 22 August. 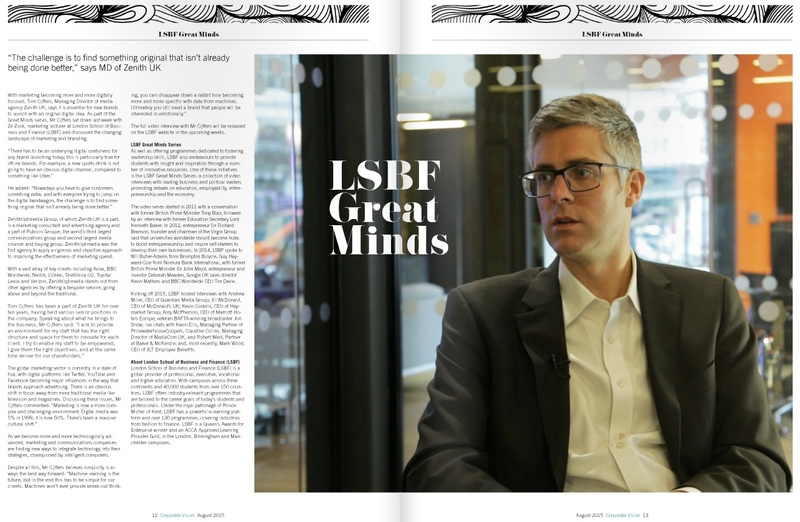 The LSBF Great Minds series interview with Zenith UK’s Managing Director Tom Cijffers was featured as a two-page spread in Corporate Vision’s August 2015 edition on Wednesday, 19 August. LSBF alumnus Ravi Shirurkar starting a social networking site ‘NextMash’ was featured in Your Story on Sunday, 16 August. LSBF Director of Research Dr Steve Priddy was quoted in The Guardian in an article discussing possible career options for civil servants after leaving their civil service jobs on Monday, 10 August. LSBF news writer Claire Payne’s article discussing how social media could be used to boost one’s online employability, was publishedin Onrec on Tuesday, 28 July. LSBF Great Minds Live most recent event welcomed Guy Hands, Founder of private equity firm Terra Firma. LSBF Head of Career Services & Employability Nadim Choudhury’s article discussing how to assess whether a career in accountancy is right for you, was published in All About Finance Careers on Monday, 27 July. LSBF Associate Lecturer Ben Botes was quoted in The Guardian in an article discussing how companies succeed through rebranding their image and corporate presence, on Thursday, 23 July. LSBF Rector & Chief Executive Professor Maurits van Rooijen was quoted in a BDaily feature on the rise in students switching careers on Wednesday, 22 July. London School of Business and Finance, and the educational and professional opportunities the institution presents to students, was featured in Say Campus Life on Tuesday, 21 July. LSBF’s Great Minds series interview with Robert West, Partner at international law firm Baker & McKenzie, was featured in Corporate Vision on Monday, 20 July. LSBF recently met with Tom Cijffers, Managing Director of the international media agency Zenith, as part of its Great Minds interview series. LSBF lecturer Jose Scheuer was quoted in a Pandle article discussing the relevance and importance of market research, on Monday, 13 July. LSBF Director of Research Dr Steve Priddy was quoted in The Guardian in an article discussing workforce productivity rates in the UK and in France, on Monday, 13 July. LSBF copywriter and news writer Erin O’Neill wrote an article titled ‘6 Tips for SMEs: How to Create, Cultivate & Keep Your Team’ for recruitment site Zealify on Monday, 6 July. Our video interview with Mark Wood, Former CEO of JLT Employee Benefits, was covered by Yahoo! Finance. In the video, which was part of our Great Minds Series, Mr Wood explains how innovation and technology have completely transformed the insurance sector over the last ten years. LSBF Rector & Chief Executive Professor Dr Maurits van Rooijen was quoted in a Business Zone article about student entrepreneurship discussing the pros and cons of more students wanting to start their own businesses on Thursday, 2 July. LSBF’s Great Minds Live series interview featuring Robert West, Partner at international law firm Baker & McKenzie, was featured in Law Fuel on Wednesday, 1 July. LSBF Great Minds Live most recent event welcomed Robert West, Partner at international law firm Baker & McKenzie. LSBF Rector & Chief Executive Professor Dr Maurits van Rooijen’s article titled ‘Do Universities Really (Not) Offer Value for Money?’ was published in Huffington Post, on Monday, 29 June. LSBF Director of Research Dr Steve Priddy was quoted in ACCA Global's Accounting & Businessmagazine in an article about accountancy careers in the oil and gas sector on Friday, 26 June. LSBF Director of Research Dr Steve Priddy’s article noting that clean tech R&D is essential but shouldn’t come at the expense of carbon pricing, was published in Business Green on Tuesday, 23 June. LSBF Great Minds Live, on Friday 19 June, welcomed MediaCom UK MD Claudine Collins to its Sceptre Court campus in Central London. LSBF Head of Career Services and Employability Nadim Choudhury offered his expert opinions and insights in a live CV and cover letter advice clinic in a Guardian Q&A on Wednesday, 17 June. LSBF associate lecturer Jonathan Price’s comments were featured in a Guardian article on the pros and cons of joining a political party, on Saturday, 13 June. An article by LSBF Rector and Chief Executive Professor Maurits van Rooijen discussing whether a democratic system could work in the work place, was published in Financial Times on Thursday, 11 June. LSBF Director of Research Dr Steve Priddy’s letter applauding the G7 agreement to phase out fossil fuels by 2100 as a significant step forward, was published in The Guardian on Tuesday, 9 June. LSBF’s inaugural Great Minds Live event featuring PricewaterhouseCoopers managing partner Kevin Ellis, was featured in the June 2015 issue of Corporate Vision on Monday, 8 June. LSBF adding more flexibility to its GGSB BIB programme by introducing Year-2 and Year-3 entry options for students, was featured in Virtual Press Office on Friday, 5 June. A VICE article exploring what could happen to British expats if the UK leaves the EU featured comments from LSBF Director of Research Dr Steve Priddy on Friday, 3 June. LSBF Rector and Chief Executive Professor Maurits van Rooijen’s article discussing what the next generation of young people can expect from higher education was published on Huffington Post on Thursday, 4 June. LSBF Director of Research Dr Steve Priddy’s letter welcoming the Global Apollo Programme as a positive project to tackle climate change was published in The Independent on Wednesday, 3 June. 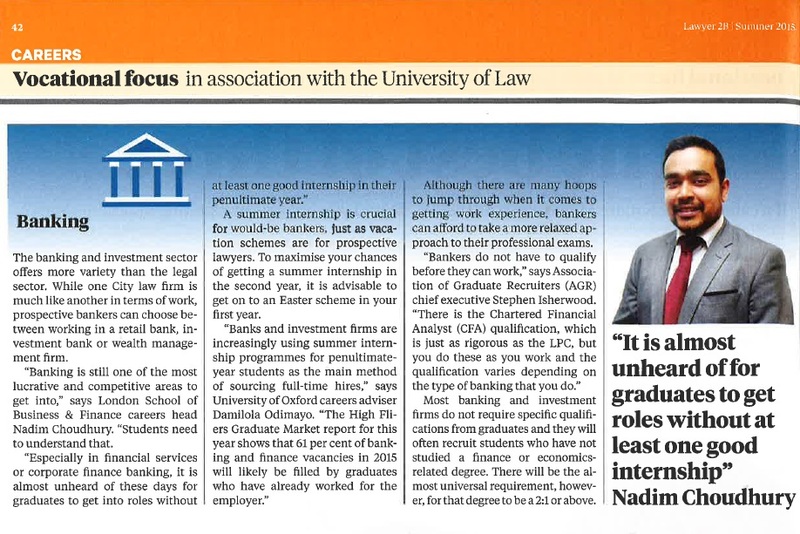 LSBF Head of Careers and Employability Nadim Choudhury’s comment on the banking and finance sector being amongst the most lucrative sectors for young graduates to further their careers was published in Lawyer2B on Monday, 2 June. The inaugural LSBF Great Minds Live event, featuring PricewaterhouseCoopers Managing Partner Kevin Ellis, was featured in IT Business Net on Friday, 29 May. LSBF ACCA student Kyle Tyrrell’s career success story was featured in Lytham St Anne’s Express on Thursday, 28 May. LSBF Rector and Chief Executive Professor Maurits van Rooijen’s article on Sajid Javid’s appointment as UK Business Secretary was published in LondonLovesBusiness on Tuesday, 26 May. A BBC News article on Thomas Cook’s brand crisis featured comments from LSBF Digital Marketing and New Media lecturer Ben Botes, on Sunday, 24 May. All About Finance Careers featured an interview with LSBF alumnus and Head of Finance at AXA Global Protect Kyle Tyrrell on Monday, 18 May. Leading Brazilian business publication Istoe Dinheiro’s article on the impact of the UK election win for the Conservative Party featured comments from LSBF CEO & Rector Professor Maurits van Rooijen’s on Friday, 15 April. As Britain went to the polls, Prof Maurits van Rooijen wrote an article for the Huffington Post about what higher education students need from the next government, on Wednesday, 6 May. LSBF CEO & Rector Professor Maurits van Rooijen’s article discussing how small colleges can survive despite facing challenging circumstances was published in the New England Diary on Friday, 24 April. LSBF CEO & Rector Professor Maurits van Rooijen’s letter highlighting that political point-scoring is threatening educational institutions, was featured in the Financial Times on Friday, 24 April. LSBF associate lecturer Jonathan Price was interviewed on a BBC News discussion on Tesco’s finances on Wednesday, 22 April. LSBF in Singapore’s involvement in the 28th SEA Games was chronicled in Yahoo News Singapore on Monday, 20 April. LSBF CEO and rector Professor Maurits van Rooijen’s article on good and bad entrepreneurship was published in Fresh Business Thinking on Tuesday, 14 April. LSBF CEO & Rector Professor Maurits van Rooijen’s article ‘Online Learning - the Best Is Yet to Come’ was published in Huffington Post on Tuesday, 7 April. Cheryl de las Heras Oliver, careers and student welfare manager at LSBF Manchester, was quoted in an article on the pros and cons of job-hopping in ACCA Global’s Student Accountant magazine on Wednesday, 1 April. LSBF CEO & Rector Professor Maurits van Rooijen’s article on how education can power the business leaders of tomorrow was published in Fresh Business Thinking on Friday, 27 March. LSBF CEO & Rector Professor Maurits van Rooijen was featured in an article on how to pick the right course for a business career in The Telegraph on Friday, 27 March. LSBF CEO and Rector Professor Maurits van Rooijen was featured in a ‘Meet the Dean’ feature in The City magazine’s March 2015 edition. LSBF CEO & Rector Professor Maurits van Rooijen’s article on location being key for educational institutions to attract international students was published in University World News on Friday, 20 March. LSBF Associate Lecturer Jonathan Price’s comments on the benefits of using percentages when reporting growth statistics were featured in a Selectism article on financial reporting for the fashion industry on Wednesday, 18 March. LSBF CEO & Rector Professor Maurits van Rooijen’s article on student experience in higher education was published in the Huffington Post on Wednesday, 4 March. The opening of the new Sceptre Court campus by LSBF’s royal patron HRH Prince Michael of Kent was featured in Study Travel Magazine on Tuesday, 3 March. LSBF and its MBA programme were referenced in a Young Academic article titled ‘Should you consider and MBA?’ on Monday, 2 March. LSBF’s ‘money back guarantee’ education offer being responsive to the needs of students was mentioned in the Telegraph on Thursday, 26 February. LSBF CEO & Rector Professor Maurits van Rooijen’s article titled ‘Is There Such Thing as a Recipe for Business Success? Was published in Fresh Business Thinking on Friday, 20 February. LSBF Head of Research Dr Steve Priddy’s article on the oil price slump’s impact on renewable energy investment was published in Business Green on Monday, 9 February. Comments from LSBF Director of ACCA Paul Merison and Head of Research Dr Steve Priddy were featured in an ACCA Global article on how to become a high-performing professional on Friday, 6 February. LSBF CEO & Rector Professor Maurits van Rooijen’s comments were featured in an I-CIO article on online education on Saturday, 31 January. An i Newspaper article on the distinctive prospects that London provides students featured comments from LSBF CEO & Rector Professor Maurits van Rooijen, on Thursday, 29 January. LSBF CEO & Rector Professor Maurits van Rooijen’s comments were featured in The Independent on London’s unique opportunities for students, on Thursday, 29 January. LSBF CEO & Rector Professor Maurits van Rooijen’s article on student diversity in the UK was published in Huffington Post UK on Monday, 26 January. LSBF CEO & Rector Professor Maurits van Rooijen’s article discussing ‘Are team players better leaders than brilliant individuals?’ was published in Marketing Week on Wednesday, 21 January. Opinion piece by Maurits van Rooijen published following the NAO report coverage on Times Higher Education on 11 December 2014. Nadim Choudhury shared expert advice in a live debate about Christmas job hunting hosted by the Guardian. Please click here to read his advice. LSBF Rector and CEO Professor Maurits van Rooijen’s article on three ingredients for leadership success was published in City AM on Wednesday, 9 January 2015. Opinion piece by Maurits van Rooijen published following the NAO report coverage in the Guardian. LSBF’s Great Minds interview with Deborah Meaden and salient points that arose from that discussion were featured in the Epoch Times on Monday, 24 November. Britain’s prowess as a global financial powerhouse being more than just about London and LSBF’s strategically-important positioning at the heart of both the UK capital and Manchester were chronicled in The Impartial Reporter on Monday, 17 November. LSBF CEO and Rector Professor Maurits van Rooijen’s article on university fees was published in The Telegraph on 13 November, 2014. LSBF CEO and Rector Professor Maurits van Rooijen participated in The Guardian’s live Q&A on how to be a successful boss, on 12 November, 2014. The full interview is available here in Portuguese. LSBF’s ‘Great Minds’ series interview with businesswoman and Dragon’s Den star Deborah Meaden on education and entrepreneurship was featured in The Telegraph on 21 October, 2014. Tips on ‘how new employees could make a good impression in the workplace’ by Nadim Choudhury, LSBF head of career services and employability, were published in The Sun, Sun Employment andThe Scottish Sun, on 9 October, 2014. 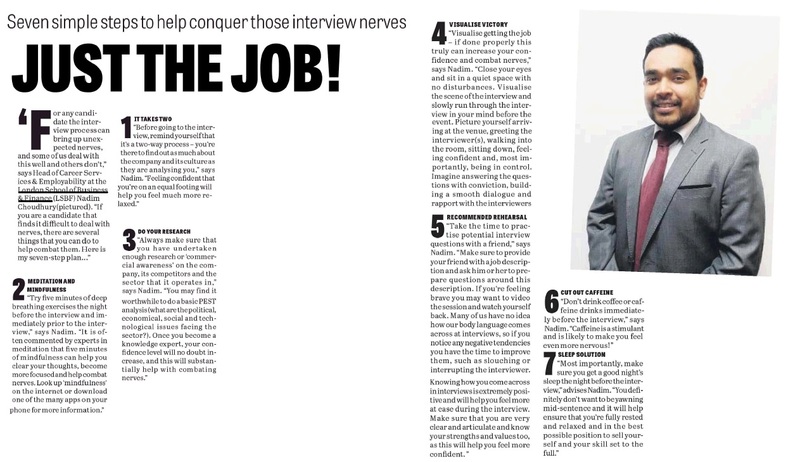 Steps for ‘conquering interview nerves for jobseekers’ by Nadim Choudhury, LSBF head of career services and employability, were featured in The Bucks Herald, on 8 October, 2014. LSBF Business Development and Placements Executive Emma Felton’s comments were featured in an ACCA Global article on how newly-qualified accountants could build successful careers on Saturday, 4 October. LSBF’s participation, as a GUS institution, in the ‘World Education’ exhibition in Bulgaria featuring 60 leading European educational institutions was mentioned in The Investor on 3 October, 2014. The Association of International Accountants’s AIA Worldwide website featured LSBF tutor Hafeez Qazi as the winner of the ‘Accountant of the Year’ honour at AIA Awards 2014, on 3 October, 2014. LSBF tutor Hafeez Qazi winning the AIA Accountant of the Year 2014 award was mentioned in PQ Magazine, on 3 October, 2014. The industry report on ‘what employers want’ from GAAPweb and LSBF was mentioned in the latest edition of PQ Magazine on 1 October, 2014. Paul Merison, LSBF Director of ACCA, provided tips on how to improve optional ACCA paper pass rates in PQ Magazine’s October 2014 edition on 26 September, 2014. Brazilian student Luiza Rabello winning a scholarship to study at LSBF was featured in Entretenimento on 23 September, 2014. A report on how Africa’s growing population makes it a key business market, originally published on the LSBF Blog, was featured in Africa Business Communities on 23 September, 2014. Peterborough Evening Telegraph featured LSBF Head of Career Services and Employability Nadim Choudhury in an article on tips to conquer interview nerves, on 18 September, 2014. LSBF Director of ACCA Paul Merison’s article titled ‘Graduates need jobs, not more debt’ was published in Accounting Web on 15 September, 2014. Dr Steve Priddy, LSBF Head of Research, was quoted in an Istoe Dinheiro article on the potential impact of a Scotland’s exit from the Union on 12 September, 2014. The European Commission funded workshop on ‘Building the Capacity of Pakistan’s Business Sector to Benefit from Dividends of Peace’, conducted by LSBF and International Alert was featured in Daily Times (Pakistan) on 11 September, 2014. LSBF and GAAPweb’s report on what financial sector employers look for in prospective first-job candidates was covered by Biziliant on 11 September, 2014. LSBF and International Alert’s workshop on ‘Building the Capacity of Pakistan’s Business Sector to Benefit from Dividends of Peace’, funded by the European Commission, was covered by The International News (Pakistan) on 11 September, 2014. Graham McDonald, LSBF CFA Programme Director, was quoted in a Money Marketing article on pension benefits, on 11 September, 2014. LSBF, represented by Regional Business Development Executive (Latin America) Jessid Agon, signed an agreement in Mexico with Coparmex to provide scholarships for various courses and programmes. This event was covered in Tiempo on 9 September, 2014. An MSN UK article on simple ways to save money during the winter featured comments from LSBF Head of Research Dr Steve Priddy on 8 September, 2014. Nadim Choudhury, Head of Careers and Employability at LSBF, took part in a live Q&A hosted by The Guardian about getting a graduate job in the public sector. Clitheroe Advertiser & Times and The Garstang Courier published a piece about seven simple steps to help conquer those interview nerves by-lined by Nadim Choudhury, LSBF head of career services and employability. LSBF CFA programme director Graham McDonald’s article on how to achieve ‘comfort level’ in pension savings was published in PQ Magazine on 29 August, 2014. An interview with LSBF-GGSB student Adriana Kubikova on her experience studying in London was featured in Czech publication Deniz.cz on 25 August, 2014. A report by LSBF on financial sector employers’ tips for succeeding at one’s first job was published in PRweb on 21 August, 2014. GAAPweb published an article on what financial accounting employers want by LSBF Director of Professional Courses Rob Sowerby on 21 August, 2014. LSBF Director of Professional Courses Rob Sowerby was interviewed on the ‘Wake Up London’ television show about professional courses and accountancy career options for school-leavers onLondon Live on 20 August, 2014. LSBF in Singapore’s signing of a memorandum of understanding with Amirta International Institute of Hotel Management (AIIHM) in Chennai, India, was covered by The New Indian Express on 20 August, 2014. LSBF’s partnering with UKTI to take part in UKTI’s Postgraduates for International Business (P4IB) programme, an initiative that offers work placements to EU students at a wide range of organisations based in London, was featured in PRweb on 17 August, 2014. LSBF’s ACCA for School Leavers professional course launch was covered across multiple media over the past two weeks. The Caribbean Tourist Organisation Foundation’s new scholarship programme to help tourism and hospitality students study at LSBF and other institutions was covered in Travel Daily UK on 8 August, 2014. LSBF Head of Research Steve Priddy’s article on ethics in business was published in the latest edition of NQ Magazine. LLSBF Business Development & Placements Executive Emma Felton’s reflection on her participation in a career guidance tweet-up was published in GAAPweb on 23 July, 2014. 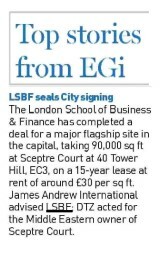 LSBF’s acquisition of a new flagship property, Sceptre Court, at Tower Hill, was mentioned in Estates Gazette on July 23, 2014. LSBF being shortlisted as a finalist at the National Business Awards 2014 under the ‘Inflexion International Growth Business of the Year’ category was featured in Yahoo Finance,FinanzNachrichten and iStockAnalyst, on 17 July, 2014. A letter to The Daily Telegraph on how British managers need to focus on their social purpose rather than financial targets and build for the future was co-signed by LSBF Head of Research Dr Steve Priddy on 15 July, 2014. Tips from LSBF’s official twitter account on CV-building and how to prepare for interviews were shared by GAAPweb on 14 July, 2014. LSBF Business Development & Placements Executive Emma Felton participated in an online GAAPweb ‘tweetup’ session on PQ/NQ recruitment, on 9 July, 2014. Sir John Major’s conversation with LSBF about the importance of education as part of our ‘Great Minds’ interview series was featured in the London Evening Standard, on 21 June, 2014. After an interview with Aaron Etingen, Valor Economico, Brazil’s most influential business newspaper, published a half-page story about LSBF and how the school has been revolutionising the world of business education through innovation, online learning and global vision. The feature was published both online. LSBF lecturer Martin Jones’ article advising PQs on ‘Heaps’ was published in the July edition of PQ Magazine, on 21 June, 2014. Global University Systems’ acquisition of GISMA business school in Hannover was mentioned in theFinancial Times on 20 June, 2014. LSBF CEO & Rector Prof Maurits van Rooijen and LSBF Head of Research Dr Steve Priddy were featured in an article on how SMEs can recover from setbacks in The Week, on 16 June, 2014. The News (Pakistan) featured a story on the students from the Lahore College for Women University who have won CIMA scholarships to pursue a two-week business course at LSBF, on 12 June, 2014. Nadim Choudhury, LSBF Head of Career Services and Employability, was featured in an ACCA Global: Accounting and Business article on how to become a successful FD or CFO, on 7 June, 2014. An ACCA Global: Accounting and Business piece on working with remote managers included comments from FBT Careers and Student Welfare Manager Usman Tahir, on 6 June, 2014. LSBF Head of Research Dr Steve Priddy was quoted in an ACCA Global: Accounting and Business article on tax matters, on 5 June, 2014. LSBF Rector & CEO Prof Maurits van Rooijen’s spoke with The Daily Telegraph: Business Reporter on why successful entrepreneurs don’t always make the best exit strategists. Russian news site Izvmor covered the story of Mordovia State University student Alexander Ekimov receiving a $24000 scholarship to study at LSBF. LSBF’s Royal Patron HRH Prince Michael of Kent’s charitable work in supporting LSBF was chronicled in Royal Central. LSBF ACCA tutor Hafeez Kazi’s article on activity-based costing to boost organisational performance was featured in the May 2014 edition of PQ Magazine. LSBF hosting the Financial Trading Week for students of its GGSB MSc in Finance programme was covered in the May 2014 edition of NQ Magazine. LSBF Head of Research Dr Steve Priddy’s article on climate change was published in the May 2014 edition of NQ Magazine. LSBF graduate Bony Dashaco was featured in a Jeune Afrique piece on Cameroonian citizens successfully delivering new technological services internationally. LSBF’s Beat Phil campaign was featured in employability expert David Shindler’s Learning to Leap blog on Sunday, 18 May. LSBF lecturer Andrew Walker was mentioned in a Supply Management piece on Strategic Information Systems on Thursday, 8 May. LSBF & Liverpool FC E.L.I.T.E.S’ initiative to bring its Management & Leadership training program to JetBlue Park in the US was published in Naples News on Wednesday, 7 May. LSBF Executive Chairman and Founder Aaron Etingen was featured in Accountancy Age’s ‘35 Under 35’ list as one of the best and brightest accountancy talents in the UK on Tuesday, 6 May. LSBF’s Beat Phil campaign was featured in an AllDay Creative blog article on creating strong and successful marketing campaigns through good copywriting. LSBF & LFC’s E.L.I.T.E.S School of English & Football ‘student travel plan’ initiative was launched in India in partnership with travel giant Cox & Kings in mid-April 2014. Announced at a press conference held in Kolkata, the response to this project’s launch has been overwhelming with over 20 media outlets featuring this announcement. Other publications that covered this story included NewsR, Travel Trends Today, Travel News Digest, NewsWala, Travel Biz Monitor, Shiksha and Smart Investor. LSBF’s Global MBA and MA in Finance and Investment programmes were featured in a Gulf News article on careers in Islamic Finance on Wednesday, 9 April. On 2 April, Tengri News reported that LSBF student Arina Andryushina is set to be a contender for the ‘Miss USSR UK 2014’ title, having made it to the final round! LSBF lecturer Martin Jones’ article titled ‘Word Blind’ was published in PQ Magazine on Tuesday, the 1st of April. LSBF Masters in Marketing alumnus, Adeaga Oluwabukunmi, was interviewed by Nigerian Tribune on the fashion business industry on Sunday, the 30th of March. LSBF associate lecturer Paul Bisping’s article titled ‘Post Kraft/Cadbury M&A activity in the UK’ was published in Business Sale on Wednesday, the 26st of March. A SpyGhana feature on ‘The Islamic System of Banking in Ghana’ featured comments by LSBF associate lecturer Sahar Ata on Saturday, the 22nd of March. An article by Sahar Ata titled ‘Islamic Finance – Value for Money’ was published in InterContinental Finance on Friday, the 21st of March. Times Higher Education published a statement from St Patrick’s College Principal Professor Daniel Khan as a correction for an earlier article that misstated St Patrick’s College’s public funding numbers, on Thursday, the 20th of March. LSBF Founder & Executive Chairman Aaron Etingen’s article on how to get investment from angel investors was published in Real Business on Friday, the 14th of March. NYU’s new Certificate in Digital Marketing – Global, delivered via InterActive, has been featured on marketing website Ad Ops Online. Dr Steve Priddy and Aaron Etingen have both written articles for this month’s NQ Magazine. While Dr Steve Priddy’s piece was focused on the stock market, Aaron Etingen shared some insights on how entrepreneurs can seek investment for their startups. A marketing agency YourDigitalStory article on digital marketing referred to LSBF as a top school, and recommended the NYU Certificate in Digital Marketing – Global, on Wednesday, the 12th of March. Comments from LSBF’s careers and employability department were featured in an ACCA Global article on ‘How to Improve Your Team-Player Skills’, on Thursday, the 6th of March. LSBF Head of Undergraduate Studies Karina Kizhner’s comments were featured in The Telegraph, in an article titled ‘Start Your Homework for University’, on Thursday, the 27th of February. Straits Times covered the launch of LSBF’s new CBD campus in Singapore on Wednesday, the 26th of February. The opening of LSBF’s new campus in Singapore was chronicled in AsiaOne on Wednesday, the 26th of February. InterActive COO, Vitaly Klopot, took part on a live Q&A promoted by leading British newspaper The Guardian. Alongside other guests, he answered questions about startups and entrepreneurship. You can read some of his comments here. LSBF’s opening of a new campus in Singapore was mentioned in The Business Times on Thursday, the 20th of February. Computing.co.uk reported on St Patrick’s College’s deployment of Microsoft Surface RT tablets familiar application framework in bespoke development on Tuesday, the 18th of February. M&A Online published an article by LSBF Associate Lecturer Paul Bisping on ‘M&A activity in the UK post-Kraft/Cadbury deal’ on Monday, the 17th of February. LSBF Associate Lecturer Peter Jansen’s presentation on corporate governance was mentioned in The Diplomat on Thursday, the 13th of February. An article on ‘5 top tips to ensure you rank highly on LinkedIn’ by LSBF Careers & Student Welfare Manager Alex Carroll was published in Real Business on Wednesday, the 12th of February. LSBF Careers & Student Welfare Manager Alex Carroll’s article titled ‘How to Improve as a Team Player’ was published in Real Business on Monday, the 10th of February. LSBF Chairman and Founder Aaron Etingen’s piece on ‘How to Make the Jump to Entrepreneurship’ was published in Real Business on Thursday, the 31st of January. LSBF Chairman and Founder Aaron Etingen winning ‘Accountancy Personality of the Year’ was reported inAccounting Web on Wednesday, the 29th of January. AIA featured an article on the PQ Magazine Awards 2014 where LSBF Chairman and Founder Aaron Etingen picked up an ‘Accountancy Personality of the Year’ award. LSBF Head of Research Dr Steve Priddy’s article on corporate governance and ethics was published in this month’s NQ Magazine. NQ Magazine chronicled the London Academy of Training’s Professional Trading Financial Programme, offered in partnership with LSBF, in this month’s edition. LSBF Chairman and Founder Aaron Etingen’s article advising entrepreneurs on what to expect when they launch their own business was published in this month’s NQ Magazine . Nadim Choudhury, Head of Careers at LSBF, was featured in an article about the UK's latest employment figures on HRreview. You can read his comments here. St Patrick's College's push towards offering students tablet-based education was featured with a video on the Microsoft Surface blog on Wednesday, the 22nd of January. LSBF Singapore accruing ACCA Platinum status was reported in Yahoo Finance on Monday, the 20th of January. LSBF Singapore's newly-gained ACCA Platinum status was covered in EIN News on Monday, the 20th of January. The Telegraph (India) reported on LSBF in Singapore being awarded with ACCA Platinum Approved Learning Partner Status on Monday, the 20th of January. LSBF Rector & CEO Professor Maurits Van Rooijen's article on higher education was published in University World News on Friday, the 17th of January. The LSBF-Baker Tilly scholarship was covered in Accountancy Age on Tuesday, the 14th of January. Dr Steve Priddy, LSBF Head of Research, was featured in a Financial News article on 'Why big data is big business for asset managers' on Monday, the 13th of January. LSBF Group Operations Director Beverley Stewart participated in a discussion about improving efficiency in small businesses on The Guardian. Confirmation of LSBF Canada’s right to recruit students after a successful legal appeal against recruitment-restriction was covered in Education Investor on Monday, the 6th of January. LSBF’s Springboard Scholarship was covered in Scholarship Times on Sunday, the 5th of January, in a piece detailing the specifics of the scholarship programme. LSBF alumnus Alessandro Rovati was featured in a Huffington Post article on his tech venture CrowdRooster. Entrepreneur Country published an article titled ‘5 Tips on how to improve your LinkedIn Profile’ by LSBF’s Careers and Student Welfare Manager Alex Carroll on Wednesday, the 18th of December. LSBF Founder Aaron Etingen’s article titled ‘Making the Jump in to Entrepreneurship’ was published in Entrepreneur Country on Monday, the 16th of December. Marketing Magazine featured LSBF’s marketing courses portfolio in an article titled ‘Course Deconstruct’. LSBF ACCA & MBA student, and Student Association President, Asmat Ullah was featured in an ACCA Global article titled ‘Making Sense of Studying’. LSBF Lecturer Paul Merison wrote an article on substantive testing, the final part of a 2-part series on ACCA F8, in the December edition of PQ Magazine. UKTI's publication on UK Excellence in Islamic Finance featured a description of a selection of courses offered by LSBF on the subject. LSBF's cementing of its partnership with CIMA with the signing of an MoU for the Middle-East, South Asia and North Africa region was reported in the Daily Times. The Express Tribune published an article covering the MoU-signing between LSBF and CIMA for the Middle-East, South Asia and North Africa region. LSBF and CIMA's MoU-signing was covered in Business Recorder on Tuesday, the 26th of November. Fay Drewry, Managing Director of The Language Gallery, was featured in HRreview HRreview in an article on the importance of foreign language skills for the UK workforce. Pakistan's biggest English daily Dawn reported on LSBF's MoU signing with CIMA for the Middle-East, South Asia and North Africa region. LSBF was mentioned in an article about online MBAs published today by The Daily Telegraph. The Scholarship-Positions.com website reported on LSBF's Springboard Scholarship on Friday, the 22nd of November. Daily Mirror (Sri Lanka) chronicled the cementing of ties between LSBF and CIMA by featuring their signing of a Memorandum of Understanding in Colombo. LSBF's signing of a Memorandum of Understanding with CIMA for the Middle-East, South Asia and North Africa regions was reported in Sri Lanka's Daily Financial Times. Study InterActive Managing Director Vitaly Klopot was featured in Real Business in which he wrote an article on e-commerce shaping today's higher education economy. LSBF Rector & CEO Prof Maurits Van Rooijen's article on higher education leadership was published on the University World News website. The November 2013 edition of NQ Magazine featured a piece titled 'Your Time is Now!' by LSBF Founder and Executive Chairman Aaron Etingen on accountant entrepreneurs. LSBF Head of Research Dr. Steve Priddy penned a piece title 'Sustainability, accounting, language and law' in the November 2013 edition of NQ Magazine. LSBF's 'Learn Then Earn' Springboard Scholarship programme was mentioned in the Evening Standard on Wednesday, the 13th of November. LSBF Head of Career Services & Employability Nadim Choudhury participated in a Guardian Q&A as one of a panel discussing how to manage workplace stress on Tuesday, the 12th of November. A news piece regarding LSBF's Springboard Scholarship programme was published in Salford Online on Sunday, the 10th of November. Prof Maurits Van Rooijen was interviewed by Bolton FM’s Kevan Williams about LSBF’s ‘Learn Then Earn’ Springboard Scholarship. The Thread Radio’s Nick Hawkins hosted a show that featured LSBF’s Springboard Scholarship. LSBF Rector & CEO Prof Maurits Van Rooijen spoke to Big City Radio’s John Taylor regarding LSBF’s new ‘Learn Then Earn’ proposition for prospective students. Express FM Portsmouth’s Phill Russell interviewed LSBF Rector & CEO Prof Maurits Van Rooijen about the Springboard Scholarship on Thursday, the 7th of November. LSBF’s Springboard Scholarship was covered in the BDaily by Steve Goszka in an article covering the ‘Learn Then Earn’ platform that LSBF is now offering students. E.L.I.T.E.S Lead Management and Leadership Coach James Gow and Business Management tutor Dr. Colm Hickey were interviewed by Nozipho Mbanjwa live on CNBC Africa's 'Beyond Markets' show on Friday, the 1st of November. LSBF group Managing Director Valery Kisilevsky participated in a Guardian Q&A as one of a panel discussing the role of virtual offices. The EAIE featured an article by Prof Maurits Van Rooijen, winner of the 2013 EAIE Constance Meldrum Award for Vision and Leadership, on what globalisation really means for higher education. The Telegraph featured a comment from Prof Maurits Van Rooijen on the specific merits of MBAs and Master’s degrees. LSBF was mentioned in the Financial Times by Madison Marriage in an article about a high-profile Chinese delegation’s two-day visit to study mergers and acquisitions. E.L.I.T.E.S Lead Management and Leadership Coach James Gow and Business Management tutor Dr Colm Hickey were interviewed by presenter Graeme Richards live at the Expresso Breakfast TV Show in Cape Town, South Africa. LSBF’s Head of Research, Dr Steve Priddy, was featured in The Guardian by Alison Coleman in an article on techniques to make businesses more efficient. Business Day, a national daily newspaper in South Africa interviewed E.L.I.T.E.S’ Lead Management and Leadership Programme coach James Gow about the programme. The National published an article on how London is seeking to establish itself as the European hub of Islamic finance including a supporting comment from LSBF’s Sahar Ata. Real Business published an article on the importance of exporting education to other countries and named LSBF as a popular school amongst international students. Fin24, South Africa’s leading and biggest source of business, economics and finance news, published a news piece on the E.L.I.T.E.S Management and Leadership tour of South Africa. BBC World featured a comment from LSBF lecturer Paul Bisping in their article about currency markets this week (in Spanish). LSBF CEO Aaron Etingen took part in a Guardian Q&A as one of a panel of business experts to comment on the role of investment in business. The latest issue of PQ magazine has several LSBF mentions including LSBF lecturer Francis Braganza on the front cover, a news story about LSBF’s new LAT programme on page 8, a feature on iOS on page 21 and a feature by LSBF lecturer Martin Jones on page 27. Tech Zone covered LSBF’s deal with Microsoft to provide HND students with Surface 2 Tablets. LFC E.L.I.T.E.S launch in South Africa, the institution created in collaboration between LSBF and Liverpool FC, was covered in this video shared on YouTube. LSBF and the Global University Systems were mentioned in the Financial Times by Della Bradshaw in an article about German business schools. LSBF Students filmed interviews for Channel Five news this week. Three female students were asked to give their views on prospects for women in business today. The Management and Leadership programmes took place in Aalborg, Denmark last month. Jesper Christiansen, a participant on the E.L.I.T.E.S Management and Leadership Programme and News Director at the TV2/Nord channel in Denmark wrote about his experience in the LFC Danish Supporters magazine and TV2Nord also filmed that for their evening show. The Ministry of Education and Science, Georgia featured a news article on the Memorandum of Understanding in the field of education signed between them and LSBF. Real Business published an opinion article by LSBF Head of Career Services & Employability, Nadim Choudhury. In the article, Nadim discussed how graduate employability can be improved through collaboration between universities and businesses. Financial Times covered the recent bail out of Gisma by GUS - the group that encompasses LSBF, FBT, InterActive, LCCA, The Language Gallery and ELITES, with a global presence and over 38,000 current students from 150 countries across the globe. GUS aims at empowering higher education institutions, such as GISMA, with the tools needed to gain global presence. Social Media Portal wrote a feature on LSBF’s ‘Be who you want to be in business’ integrated marketing campaign. LSBF has had several mentions in the September edition of PQ Magazine. On page 8 PQ printed a picture of Aaron Etingen and President of the Students Association, Asmat Ulah with LSBF's Queen's Award. On the same page they also mentioned LSBF's eCornell + ACCA course. On page 12 PQ covered the ACCA graduation ceremony at LSBF Singapore. On page 14 you will find an article written by LSBF Senior Lecturer, Francis Braganza, on how to tackle the Financial Reporting paper. At the end of August The Guardian published an article on SME market research featuring a supporting comment from LSBF lecturer Jose Scheuer. Real Business Magazine published an article written by our Rector & CEO Maurits van Rooijen on the economy of immigration article. Social Media Portal covered LSBF's 2013 Animal Facts clearing campaign and discussed the digital and traditional marketing approaches used to reach undergraduates. This August LSBF's Dr Steve Priddy featured in The Guardian's article about whether climate bonds could pave the way to a low-carbon economy. LSBF's CEO and founder, Aaron Etingen was discussed in The PIE News' profile on international education entrepreneurs. The article discussed Aaron's background, how he went about founding LSBF and his plans for the future development of the company. Dr Steve Priddy's article on Capacity Building was featured in the August edition of Training Journal magazine and on their website. TJ magazine were very interested in the article and are already looking forward to future pieces from Dr.Priddy. In early August The Guardian published a blog written by Dr Steve Priddy on career opportunities in the energy sector. LSBF's new partnership with the London Academy of Training (LAT) was covered by Study Travel Magazine with a supporting comment from LSBF CEO and Rector, Maurits van Rooijen. LCCA Senior Lecturer Lee Yi took part in the Guardian Small Business Network Q&A live on the Guardian website as one of a panel of experts on the travel and hospitality industry. The panel answered questions and gave advice on how to start up a travel business. i-Magazine published an article written by LSBF’s Rector & CEO Prof Maurits van Rooijen entitled ‘The Reinvention of Learning’. Finance lecturer at LSBF, Jonathan Price was interviewed by The Guardian newspaper this week for a story on investment policy and pension funds. To read the full article, click here. NQ Magazine also featured several LSBF mentions in its July edition. On page 4 NQ Magazine covered the LSBF School of Entrepreneurship along with a picture of CEO Aaron Etingen, Rector & CEO Maurits van Rooijen and Sir Richard Branson. On page 14 you will find a piece on LSBF's eCornell courses. Our ELITES programme, delivered in partnership with Liverpool Football Club, is going to Scandinavia! Following the success of highly-acclaimed pilot programmes at Liverpool Football Club Academy in June, it will be the first time the programme will be delivered outside the UK. The story made headlines in the UK and internationally on websites such as FC Business, The Business Desk and Champion News. International education news publication The PIE News covered the rebranding of the LSBF School of English to The Language Gallery. TLG managing director, Fay Drewry told The PIE all about how the new name attempts to capture TLG's extended offerings and pay homage to the history of Bloomsbury, London – the location of its first school. Education Investor printed an article about LSBF's partnership with Cornell University and the online eCornell courses available to students. The article included a quote from Chief Executive at InterActive, Dan Sommers. Education Investor also published an article on access to student loans for students in private higher education, which included a quote from CEO and Rector for LSBF, Maurits van Rooijen. A blog post on entrepreneur.com signed by Richard Branson referenced his meeting with LSBF and discussed the programs we have in place to help budding entrepreneurs. Bay TV Liverpool reported on the new E.L.I.T.E.S global training and education initiative created by LSBF and Liverpool Football Club which explores the transferrable skills within the world of sport and business. The Daily Telegraph published a special report on Oil and Gas MBAs, featuring LSBF's Global MBA (Oil Gas & Energy Management) in an interview with Director of Research, Dr Steve Priddy. The report discussed the growth in specialist MBAs and detailed the areas covered by LSBF's program which is offered as a part-time or distance learning course. University World News published an article on e-learning through public-private partnerships written by LSBF Rector & CEO Maurits Van Rooijen. "E-learning is certainly something that all higher education leaders should be considering as an alternative tool for expanding global reach." LSBF’s exclusive video interview with Richard Branson was published by Branson’s own Virgin Entrepreneur Blog. During the interview conducted by David Blunkett MP, Sir Richard Branson discussed the role of education in providing support for young entrepreneurs. Times Higher Education featured the LSBF video interview with Richard Branson in its own weekly roundup. During the interview conducted by David Blunkett MP, Sir Richard Branson discussed the role of education in providing support for young entrepreneurs. The Telegraph and Yahoo both showed an interest in comments made by Richard Branson in our exclusive LSBF video interview conducted by former Education Secretary David Blunkett MP. Sir Richard Branson shared with us how he wished he had been able to attend university in his thirties and discussed universities' invaluable role in providing mentors for young entrepreneurs. Following LSBF's announcement of their partnership with Liverpool Football club to deliver a series of leadership and management training programmes, Helen Davies from the Liverpool Daily Post discusses how these transferrable skills can be beneficial to businesses. The joint venture between LSBF and Cornell University to form the eCornell range of online executive programmes to meet the needs of professionals and deliver more programmes in new markets was covered by numerous publications including Education Investor, The PIE News, Hotel Owner and Brazilian business newspaper Valor Econômico. Russian publication Rossiskaya Gazeta (Российская газета) announced that student Daria Bederak from Yekaterinburg was awarded a three month scholarship to LSBF after winning a People's Choice Award for her report on Economic Divergence. Colombian publication Universia asks what role social media plays in university management and lists LSBF amongst top universities such as Harvard and MIT as the institution with the third most Facebook fans at 183,000. The Financial Times mentioned LSBF in an article about the cultural and economic impact that the student community has had on the property market in certain areas of central London. INFO Magazine, a publication produced by the French Chamber of Commerce in the UK, ran an article about our Women in Business Scholarship in their latest issue. The magazine is distributed to decision makers in France and in the UK and is also available on the Eurostar and in Air France Business Class: . LSBF's new Affiliate Marketing programme, launched in conjunction with global performance network, Affiliate Window, has been featured in various online marketing publications including Econsultancy, TheDrum, Affiliates4u.com, and AffiliateWindow. 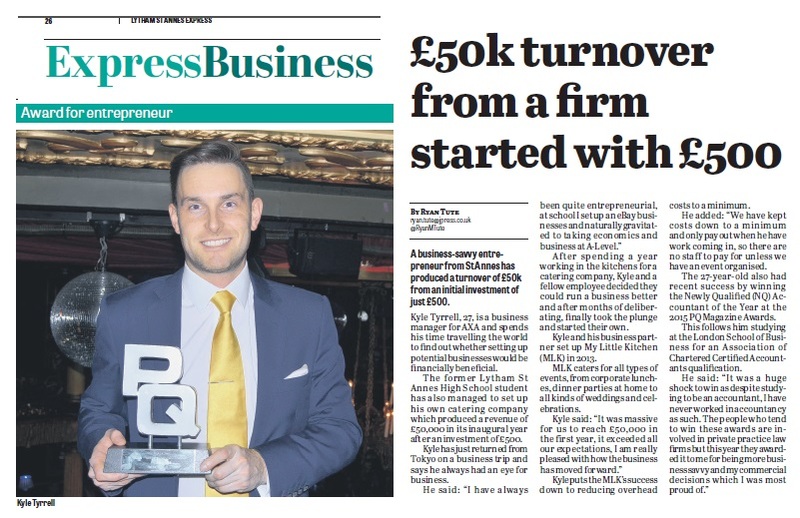 LSBF has been featured in top UK publications after being presented with the 2013 Queen's Award for Enterprise. Publications such as the Financial Times and The London Gazette mentioned LSBF as one of the UK companies who have been recognised for their exceptional contribution to the British economy. Online news sites, such as Yahoo News and ThePieNews featured articles about the developments and business achievements that led LSBF to win the accolade. LSBF’s venture on the Publishing market has been featured in the April 2013 issue of the Education Investor magazine. The article also mentions the recently announced partnership between LSBF and Liverpool Football Clubs, which saw the development of the E.L.I.T.E.S. and the development of management and leadership programmes. LSBF's Executive Education programmes in digital marketing, e-commerce and online media were mentioned in the business magazine INFO. Entrepreneur Aaron Etingen, who's the Founder and Executive Chairman of LSBF, reveals his recipe for global school success in an exclusive interview with the The PIE Review magazine, the leading publication for professionals in international education. With the launch of a new, exclusive programme in the Canadian market, the new partnership between LSBF Canada and British Columbia Institute of Technology (BCIT) has been covered by in major Canadian and UK online media, including Yahoo UK, Ewallstreet, Businessmax, Globe Advisor, Education Investor and The PIE News. The joint venture announced in March by LSBF and Liverpool Football Club was widely covered in the international and education media. Yahoo Finance, Education Investor and The PIE News, Liverpool Daily Post and World Football Insider featured stories about the new range of programmes which will be offered by the new venture E.L.I.T.E.S. Several universities have already implemented successful Career Services on social media. With the help of the careers team at LSBF, the education website Edudemic lists the reasons why universities should consider integrating 5 social media channels into their Career Services. With almost half a million users across more than 30 social media channels worldwide, LSBF has made it to the 5th position in the ranking of the world’s most social media friendly business schools. In a research that collected data from more than 300 of the top international business schools in the world, LSBF has emerged as one of the institutions that are leading the way on innovation and online student engagement. LSBF Rector and CEO Prof. Maurits Van Rooijen was interviewed by a team of producers from the largest Persian-speaking TV channel for The Money Show. The report discusses LSBF's innovative approach to education, investment and e-learning. LSBF has been mentioned on several articles in the March edition of the PQ Magazine. The second article covers LSBF’s online contest “What is your top ACCA tip” where students share their inspiring ACCA tips to win a free online ACCA paper. The magazine also features the article “Putting it on ICE”, written by LSBF’s Senior ACCA Tutor Martin Jones. In his piece, Martin addresses the question of what properties can be classified as investment properties. To read all articles, click here. Dr Steve Priddy, Head of Research at our Business School, has written an article about Carbon Entrepreneurship for the Live Better Magazine. In his piece, Dr Priddy talks about the difference between the concepts of Carbon Management and Carbon Entrepreneurship, covering the latest trends and best examples in the industry. The launch of InterActive’s Online TV Channel has been covered by the Accounting Today magazine. “The channel is part of the school’s continuing efforts to enhance students’ online learning experience and was created to provide greater learning opportunities for students worldwide. The phenomenon of online learning has been growing in the past year with the expansion of massive open online courses, or MOOCs, which are available at an increasing number of prominent universities”, says the article. The appointment of Clive Bullen, LSBF’s new Director of Publishing, has been featured in the Education Investor Magazine, one of the leading publications in the education business sector. To read more, visit the Education Investor website. The Open Day hosted by LSBF in city of Manchester was featured in local newspaper Manchester Evening News. LSBF’s Vice-Rector, Prof James Kirkbride, had a paper published in the International Journal of Disclosure and Governance. Entitled "Collibration as an alternative regulatory approach for remuneration governance: a contextual analysis of Australia", the study involved colleagues from the Universities of Sydney and the Australian Business School at New South Wales. Prof Kirkbride’s findings were originally shared at a conference at the centre for Governance Research at the University of Birmingham, and the paper was one selected from the conference for publication. The launch of LSBF and InterActive’s new online IATV was announced by Accountant Middle East, a leading accountancy magazine in the Middle East. “LSBF and InterActive have produced a wide range of quality videos with great content, which will now be available to anyone around the world. ACCA tuition will now be accessible at any time during our students’ increasingly busy and hectic lives”, says LSBF’s award-winning ACCA tutor Francis Braganza. In an article about career and postgraduate study, the leading British newspaper Daily Telegraph featured LSBF as one of the institutions leading the way in the specialist MBA market. The article was published in both the print and online versions of the paper. LSBF’s Online Global MBA has been listed by British newspaper Daily Telegraph in its MBA Supplement. The article, which covered distance learning, can be accessed here. In an article about e-learning, Vitaly Klopot, Managing Director of InterActive, give advice on the Five Things To Consider Before Teaching An Online Course. The article has been featured on Edudemic online magazine focused on new trends in education. Mr Klopot said: “the platform in which your online course will be delivered should create and provide dynamic, targeted interactions with a comprehensive approach. It should be flexible enough to be accessible from anywhere in the world and on any device”. The launch of the 3rd Generation of LSBF and InterActive’s Online ACCA has been featured once again in the PQ Accountant Magazine, a leading publication in the accountancy market. Rob Sowerby, Director of Professional Courses, said: “We were the first to offer an online ACCA tuition product. This is the third generation of our online products and benefits from the feedback gained from satisfied students”. After the visit of LSBF’s Rector & CEO, Prof Maurits Van Rooijen, to Singapore, leading business newspaper BizDaily published the story “LSBF Gears for Big Plans in Southeast Asia” which focuses on LSBF’s plans to expand its current operations in Singapore and Southeast Asian markets. “LSBF has a global reputation for education and skills development, whereas Singapore is a hub for educational excellence. What we have to offer here is unique: innovative and relevant academic and professional learning, combined with strong career development opportunities,” said Prof Van Rooijen. Leading newspaper The Guardian published the article “Master the differences” about specialist MBA programmes. LSBF was mentioned as one of the leading institutions which have developed and introduced a wide range of pathways and specialisations for its Masters degrees and MBAs. This article appeared in the online versions of The Guardian. LSBF’s online contest for ACCA students has been featured at the Accountant Middle East, the leading accountancy magazine in the region. To enter the contest, participants must submit their top ACCA exam tip. The winner will receive a free online ACCA paper, delivered via the e-learning platform InterActive. Accountancy faculties from LSBF and its academic partner FBT were featured in the article “Blogs Math And Accounting Students Should Follow”, published on Edudemic, a news portal covering innovation and technology for the education market. The article points out a selection of six reliable and engaging accounting blogs for students to use and broaden their industry knowledge. LSBF Accountancy Faculty gave their opinion and feedback about the latest CIMA Exams in an article published in the January issue of PQ Accountant, a leading magazine in the UK accountancy industry. You may access the full interview with Peter Stewart, tutor and Director of CIMA programme at LSBF, here. Study Travel Magazine, a business publication targeted at education professionals and agents, announced the appointment of Professor Dr Maurits Van Rooijen as new CEO & Rector of LSBF in their January issue. With a career spanning 25 years as an international educator, Prof Van Rooijen joined LSBF to expand innovation and academic development worldwide. After an interview with LSBF Rector and CEO, Prof Maurits Van Rooijen, Singapore-based Far Eastern Business Review magazine published an article about the institution's plans to strengthen its operations in the education market in South East Asia. “When we opened our Singapore institute, the country was an in-demand destination for students around the Asia-Pacific region, which was one of the main reasons why we have selected it as our entry point into the region. We now want to make Singapore an attractive destination to students from around the globe”, said Prof Van Rooijen. News website Accountant Middle East published a story about the 3rd Generation of Online ACCA programmes, launched by LSBF in partnership with the award-winning e-learning platform InterActive Pro. The launch of the LSBF Summer Business School has been featured in an Education Investor article. The piece explains how the structure of the programme works and our expectations for the first intake. The article also mentions the recent launch of the 3rd Generation of LSBF’s Online ACCA programmes. Education Asia Journal interviewed LSBF's Rector and CEO, Prof Maurits Van Rooijen to share his views about education and how LSBF is contributing to society. The article covers the school's global corporate and academic development, as well as its operations in Asia. "As an educational institute, we want to develop responsible global citizens, who are keen to make a positive contribution and influence tomorrow's world. It is my dream to see our graduates use their talent, knowledge and networks wisely to make a difference to society", said Prof Van Rooijen. Covering news and business analysis for professionals in international education, The PIE News in January published an extensive article about education institutions which are growing and strengthening its operations in the global market. “UK-based LSBF has also marked itself out as a key player in the private HE space, growing its programme base since 2003 to offer undergraduate and postgraduate degrees as well as professional qualification training. In 2010-11 it opened new campuses in Birmingham, Singapore, Toronto bringing the total to nine, and catered to 25,000 students in 2011 (also via its e-learning platform, Interactive) – up from 17,000”, said the article. An Edudemic article entitled “7 Ways Universities can Effectively Use Social Media” features LSBF’s pioneering use of technology and social networks to deliver and expand the access to education worldwide as well as the way we help to improve and develop the careers of students worldwide. LSBF was mentioned by Valor Econômico, the most influential business newspaper in Brazil. The school was portrayed as one of the top international institutions that are offering scholarships and bursaries for masters and MBA students. The December 2012 issue of the Education Investor magazine featured LSBF in an extensive article entitled "Growth, growth, growth". The piece reflects LSBF's latest achievements, academic quality and the exponential growth that the school has had over the last years. "To come into a place where you have to continually think outside the box and do something different is very stimulating", said LSBF's CEO & Rector Prof Maurits Van Rooijen. The online version of the article can be accessed here. LSBF and UKTI hosted an event to launch the 360° Degrees in Pakistan. The potential opportunities for Pakistani students as well as for development of bilateral business have been featured in The News, Business Recorder, The Express Tribune, Pakistan today and Dawn. Francis Campbell, Director for UK Trade and Investment, said: "With so many Pakistani students having studied or studying at British educational institutions in the UK, we have developed very good cultural ties with your country, so now we need to translate those cultural ties into business ties." Prof Van Rooijen said: "The opportunities e-learning brings to higher education are comparable to the invention of book printing (in the 15th century). I want to look at how young people embrace modern technology, especially when it comes to the acquisition of knowledge." London School of Business and Finance was listed as one of the 10 remaining institutions for the London Metropolitan Clearing House after a further 2 private institutions have been dropped. Dr. Ann Thorne, Executive Dean at LSBF was interviewed in the Independent for a clearing special. Dr Thorne is quoted in saying: "We don't necessarily build on a historical background, but look at what the students require for their future careers. Most universities have a static campus, but LSBF is lean and flexible, so we can to where the market is – for example we're setting up shop in Birmingham [to meet health sector demand]." Nadim Choudhury, Head of Career Services was interviewed in a feature on returning to studying after a break in the Student Account magazine. The London School of Business and Finance in partnership with UK Trade and Investment hosted a Global Business Summit in Lagos, bringing together some of the world’s top businesses alongside the highest calibre of young professionals. The event also included, inspirational keynote speakers from top international organisations including JP Morgan and the Chartered Institute of Bankers; and effective networking opportunities with managers and executives in the field, as well as LSBF professionals, online and on-campus students, and alumni. LSBF’s interview with Tony Blair has been featured in The Pie News in an article about the importance of international education to the British economy. During a wide-ranging interview with LSBF’s Visiting Lecturer, and Former UK Home Secretary and Education Minister, The Rt Hon David Blunkett MP, UK’s Former Prime Minister Tony Blair praised LSBF for its global professional skills development and its use of technology to deliver education worldwide. In the interview, Blunkett and Blair discuss high profile issues in higher education, ranging from graduate employment and the need for professional skills in today’s job market, to technology in education and the global economy. Reflecting on the way LSBF applies professional skills development in its programmes, Tony Blair said this was a key requirement in education institutions, which must ensure “how and what they are educating people has some realistic application in the world of work”. LSBF’s interview with Tony Blair has been featured In The Times Higher Education. LSBF have been featured on The Times today in an article about Islamic Banking. The senior lecturer Sahar Ata spoke on behalf of LSBF. LSBF were mentioned on the Education Investor website regarding our recent partnership with London Metropolitan University. Nadim Choudhury, Head of Career Services was quoted in The Independent MBA supplement on drop out figures of students on MBA courses. In a world where MBAs are expensive and resource intensive, having the staying power to complete courses can be tough. In the context of how schools can improve drop rates across MBA programmes and offer flexibility, he said, “Most good MBA programmes allow students to drop out and come back when ready”. Sahar Ata, a senior lecturer on Islamic Finance spoke to the Islamic online newspaper, Zawya on the development of the Islamic finance market. Sahar Ata said: "Egypt will be a great force in steering Islamic finance in a different direction. We will see the development of new products as the market which Islamic finance will serve is a different clientele, and will be needed to solve different problems. Al Azhar University in Cairo should play a role in developing Islamic finance in the country,"
Nadim Choudhury, Head of Career Services, advises MBA students to spend time nurturing their online presence to maximise their employability. LSBF’s Global MBA via Facebook was mentioned in The Guardian alongside other high performing and innovative institutions for its use of technology in education and best practice. GGSB’s Bachelors in International Business (BIB), delivered at LSBF's London campus, has been ranked 5th best in France by the newspaper Le Figaro, one of the largest and most influential publications in the country. The undergraduate programme, offered in an exclusive partnership between the two schools, figures amongst some of the best courses in Europe. For an online Accounting Age feature, Nadim Choudhury, LSBF's Head of Career Services and Employability highlights opportunities for new and young accountants, and advises on relevant qualifications and what the future could hold for their careers. LSBF's Marble Arch campus and business students were featured in a BBC4 documentary on business etiquette, presented by BAFTA-award winning comedian Jo Brand EXPAND Last year the Marble Arch campus was be visited by BAFTA winning comedian Jo Brand, accompanied by celebrity psychologist Judi James. Showing the lighter side of business behaviour and etiquette, our students part in an experiment about acceptable business behaviour as part of a programme 'Jo Brand on Kissing'.. If you missed it you can watch it on BBC iPlayer. Nadim Choudhury, LSBF's Head of Career Services and Employability was featured in a new series on the ACCA Careers website offering advice to students on how to deal with different employment and interview challenges. Your interview day may include lunch or another informal gathering when you meet potential colleagues. Although these occasions are not officially part of the selection process, poor "performance" can hurt your chances. Read some advice on handling Social interviews. Discussions or tasks involving several applicants help recruiters assess how you would perform in the job. We find out what they look for and how to impress them. An interview presentation is the ideal opportunity for you to shine, to showcase yourself and your achievements. It could be what clinches the deal, so you must prepare well and learn to control your nerves. Personality questionnaires are powerful tools that allow employers to predict your behaviour at work. Will you fit into the role? Will you work well with others? Are you a match or will you clash? What keeps LSBF's CEO and Founder Aaron Etingen awake at night? Aaron says "Balance is key: between operations and innovation; staff satisfaction and productivity; and family and business"
Read his interview in HR Magazine's regular column, From the C-Suite in which a different CEO-level executive each month writes about the big issues/challenges facing their sector and how they are responding. How much does where you study impact upon your career? LSBF's Head of Career Services and Employability, Nadim Choudhury has written for Graduate Recruiter Magazine, on the importance of considering a candidate's overall skill set and not just which institution they attended or what degree level they achieved. LSBF's Marble Arch campus has been visited by BAFTA winning comedian Jo Brand. Jo and the BBC4 production company interviewed a group of LSBF business students about business etiquette. The programme will be aired on BBC4 on 14th February 2012. Does online career advice work? Nadim Choudhury, Head of LSBF's Career and Employability Services explains to The Guardian and that university careers services need to rethink how they support their students. Nadim Choudhury tells the Guardian that with students soon to be paying more for their degrees and needing to see a concrete return, university careers advisers will have to up their game. Read his advice. Universities must build more industry links to improve graduate employability, LSBF's Vice-Rector Prof James Kirkbride tells the Guardian. Opinion may vary as to how much is too much to pay for a university degree, but as LSBF's Vice-Rector, Prof James Kirkbride explains in an opinion piece in the Guardian, many in higher education welcome the extent to which tuition fee reform has put the spotlight on the employability record of degree programmes. Spanish newspaper Expansion has featured LSBF as part of an article on international business schools in Spain. The Independent's MBA Guide featured LSBF graduate Puneet Jaggi, who set up his own business after completing his MBA with us. Jaggi was interviewed by the Independent as a successful LSBF Alumni whose company, Travel Decorum, is an agency specialising in travel niches. LSBF's Careers Services and network of global partners has been featured as part of The Daily Telegraph's Career Supplement and article "Insider tips for whizz-kids"..
LSBF partner college, SFD London's director, Dr Neri Karra talks about the business of fashion in the German design and fashion magazine Teaser. LSBF Group Managing Director, Valery Kisilevsky was interviewed by Bloomberg Business Week on LSBF's newly launched 360° programme and explains the rationale behind the ground-breaking job guarantee programme. He tells Bloomberg that the rationale behind the ground-breaking programme is a response to the fact that the UK is facing a difficult period with graduate employment as there are about 2 million graduates without jobs, and LSBF wanted to offer a solution for its graduates. LSBF's innovative new 360° programme, with its unique Graduate Guarantee, was featured on the Graduate Fog website. LSBF Canada Manager Director, Yuliya Etingen has been interviewed by Valor Economico, a leading Brazilian newspaper, discussing future ventures and LSBF programmes for the Brazilian market (published in Portuguese). With sustainability now a buzzword in business, an increasing number of companies around the world have been turning their attention towards how they can focus on becoming more environmentally sustainable. LSBF's Head of Research, Dr. Steve Priddy talks to CIMA FM Magazine on green reporting. LSBF's innovative 360° programme, with its Graduate Guarantee, has been featured in The Times Higher Magazine as well as several national and international newspapers including the Evening Standard, London's Metro, HR Magazine and the Wall Street Journal. Leading German newspaper Die Welt, has visited LSBF and writes about the benefits of studying at LSBF as an international student, following a visit to LSBF's London campus. Read the full translated story here. New Masters Ranking: Grenoble Graduate School of Business's Masters in Finance, delivered at LSBF's London campus and GGSB's campus in Grenoble, has been ranked ninth in the world in its category by the Financial Times. Vice-Rector, Prof James Kirkbride tells the THE that partnerships between public and private institutions are key to weathering these uncertain times. LSBF's newest campus in Singapore has opened to huge success with over a thousand students registered on courses the first few weeks. Our Singapore launch generated coverage in the New York Times via the International Herald Tribune, Forbes as well as 39 other blog and online news sites. Choosing a business Masters is like a marriage, say career experts, so before taking the plunge, reflect long and hard upon your compatibility. LSBF's Nadim Choudhury, Head of Career Services and Employability advises on how to choose the best business Masters for your needs. Your Masters will be on your CV for the rest of your life so how do you choose the right course to reap the greatest career rewards? Nadim talks to the Independent Newspaper on how to do it. LSBF's Head of Technical Research, Dr Steve Priddy talks to Financial Management Magazine about sustainability and green reporting, and is asked how much further companies need to travel before they make any progress. Reporter Neil Hodge asks those on the front line of the green business agenda which companies are making the most progress along the road to true sustainability? LSBF's Head of Professional Programmes in South Asia, Paul Merison tells the FT that where training once focused on accounting techniques and professional exams for classes that were full of men, it now accommodates a wider range of interests. Read the article in the Financial Times. As technology and globalisation have changed the world of work, it's also changed the skills employers look for, meaning today's graduates must be comfortable working as part of virtual teams spanning the globe. LSBF's innovative use of technology in education is featured as part of the Sunday Times supplement Ingenious Britain. Nadim Choudhury tells the Independent how helping students to shine and set themselves apart from the rest is high on the agenda of any careers service. Some schools are rethinking tactics and more aggressively promoting students, drawing on employee referrals and alumni connections. Nadim Choudhury, our Head of Careers and Employability has been interviewed as the LSBF expert for the UK's Independent newspaper MBA special supplement. Group Managing Director, Valery Kisilevsky writes for the Times and says that new relationships between publicly funded institutions and their younger, private sector counterparts are developing every day, and these relationships are based very much on collaboration and mutual benefit. "Private colleges reinvigorating public universities" is the focus of an article by LSBF's Group Managing Director, Valery Kisilevsky for the business section in the Times, and for the Times Online. LSBF's historic partnership signing with Shanghai University to form a new institute, the Shanghai-London School of Business and Finance was covered in six Chinese newspapers (Shanghai Global Times, Qianlong, China Youth, China.com, Netease, Beelink) and broadcast on SAU TV. In line with our continuing commitment to deliver education on a global scale, the London based business school has opened the brand new centre in Toronto; Canada's largest city. Director, LSBF Canada Yuliya Etingen spoke to Canada's leading newspaper Globe and Mail about the diversity and strength of Toronto as a financial centre.